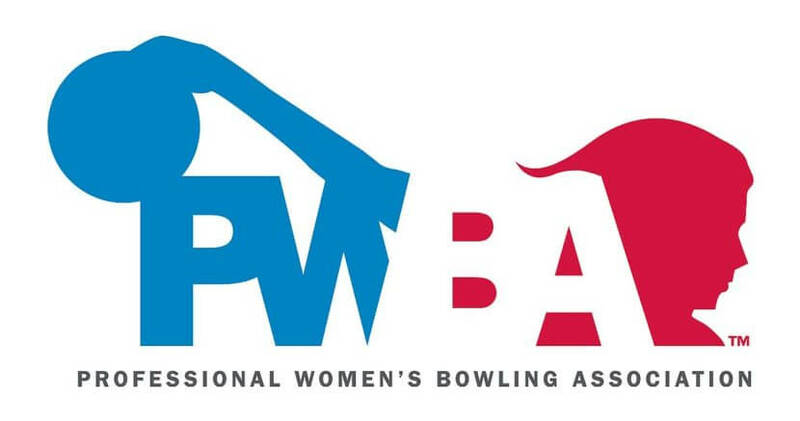 The Professional Women’s Bowling Association is the membership organization for professional female bowlers, hosting tournaments across the United States as part of the PWBA Tour. 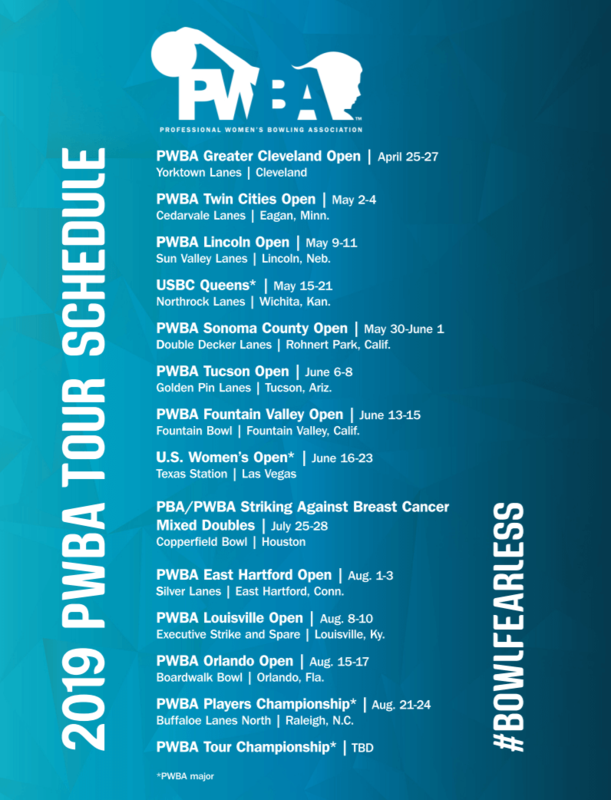 The PWBA Tour major championships include the USBC Queens, QubicaAMF PWBA Players Championship, U.S. Women’s Open and PWBA Tour Championship. PWBA was founded in 1960 and is now a joint venture of the United States Bowling Congress and the Bowling Proprietors’ Association of America. Official web site: PWBA. Professional Womens Bowlers Association Tour 2018 schedule and champions. Old Dominion Building at Richmond Raceway, Richmond, Va.
Livestream: Match 5 will feature (8) Rocio Restrepo against (13) Maria Jose Rodriguez, while Match 6 will have (10) Erin McCarthy take on (11) Diana Zavjalova at Richmond Raceway in Richmond. 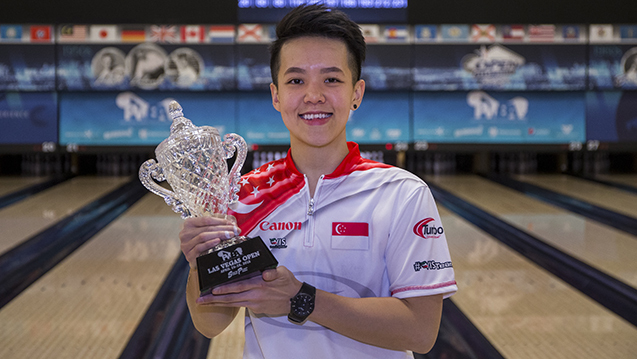 LAS VEGAS – Shayna Ng of Singapore captured her first Professional Women’s Bowling Association title, winning the 2018 PWBA Las Vegas Open on Saturday night at South Point Bowling Plaza. Ng, the No. 2 seed, defeated top seed Diana Zavjalova of Latvia, 231-211, in the championship match. The stepladder finals were streamed live on Xtra Frame, the Professional Bowlers Association’s online bowling channel. A 28-year-old right-hander, Ng opened the championship match with strikes in the first six out of seven frames, but the match was far from decided. Zavjalova, despite beginning the match with an open frame, stayed patient with spares in frames two through four and then rolled four consecutive strikes. Trouble struck Ng in the eighth frame, as she left the 4-6-10 split, to give Zavjalova the opportunity to shut out Ng with strikes in the ninth and 10th frames. But, Zavjalova left the 4-6-7 split in the ninth frame and Ng produced spares in the ninth and 10th to claim her first title. 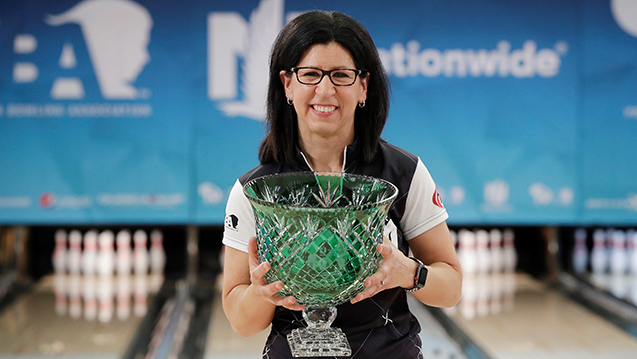 Ng had a pair of third-place finishes – the 2016 U.S. Women’s Open and, prior to the Tour’s return in 2015, the 2013 United States Bowling Congress Queens – but now has her first victory in the United States. The Singapore national team has been a constant presence on the PWBA Tour since 2015, with four players each winning one title. Jazreel Tan won the 2015 PWBA Lubbock Sports Open as a non-member, Cherie Tan captured the 2016 PWBA Storm Sacramento Open and 2016 PWBA Rookie of the Year New Hui Fen claimed the 2016 PWBA Tour Championship. Ng is happy to join her teammates as PWBA champions. Ng advanced to the title match after defeating USBC Hall of Famer and 26-time PWBA titlist Leanne Hulsenberg of Pleasant View, Utah, 193-167. 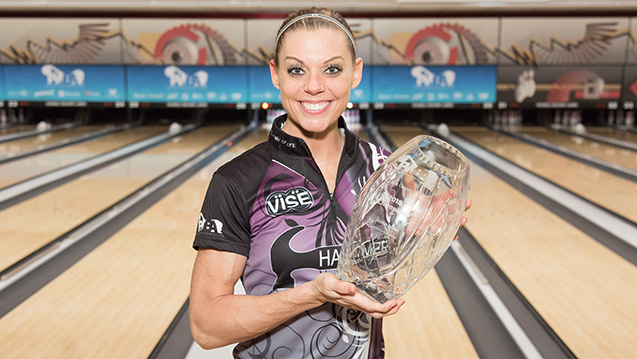 Hulsenberg was searching for her first title since the relaunch of the PWBA Tour. Hulsenberg opened the stepladder finals with a 213-202 victory over fellow USBC Hall of Famer and reigning three-time PWBA Player of the Year Liz Johnson of Palatine, Illinois. Competition this week at the PWBA Las Vegas Open at South Point Bowling Plaza included two eight-game qualifying blocks on Friday to determine the 32 players for Saturday’s Round of 32. An additional eight-game block Saturday morning narrowed the field to 12 players, who bowled six additional games to determine the stepladder finalists. The 2018 PWBA Tour season continues next week with the PWBA Sonoma County Open at Double Decker Lanes in Rohnert Park, California. Qualifying and match-play rounds of PWBA Tour events are broadcast on Xtra Frame, which also will be the live-stream home for the stepladder finals of seven standard events. Go to PWBA.com for more information about the PWBA Tour. Champion: Shannon O’Keefe of O’Fallon, Ill.
ROHNERT PARK, Calif. – Shannon O’Keefe of O’Fallon, Illinois, came into the week with fond memories of Double Decker Lanes, and she will leave with one more after capturing the 2018 Professional Women’s Bowling Association Sonoma County Open. In a title match for the ages, O’Keefe, the No. 4 seed, defeated top seed Verity Crawley of England, 268-266, on Saturday. The stepladder finals were streamed live on Xtra Frame, the Professional Bowlers Association’s online bowling channel. The championship match began in a flurry with both players combining for 15 out of 16 strikes through eight frames, with O’Keefe owning the only non-strike when she spared in the first frame. Crawley left the 1-3-6 combination in the ninth frame to end her run at perfection, giving O’Keefe the opportunity to lock up her seventh career PWBA Tour title if she could throw strikes in the ninth and the first shot in the 10th frame along with an eight count spare in the final stanza. O’Keefe struck in the ninth but left a 10 pin on her first shot in the final frame. She made the spare and filled nine pins on her final offering. Crawley, who finished second at the 2017 PWBA Fountain Valley Open and 2017 PWBA Greater Detroit Open, would have the chance to win her first PWBA Tour title if she could double in the 10th frame. She left a 7 pin on her first shot, giving O’Keefe her second Sonoma County Open title in three seasons. The range of emotions were significant for O’Keefe during the title match, but being able to manage them were key. With the win, O’Keefe now has claimed at least one win in each season since the relaunch of the PWBA Tour in 2015. Her success was nothing more than a dream just a few years ago. The win for O’Keefe was extra special because of the family’s recent loss of their 13-year-old dog, Cola. She was an important part of the O’Keefe family, and she may have given O’Keefe the extra help she needed to take home the title. O’Keefe advanced to the title match after defeating last week’s PWBA Las Vegas Open champion, Shayna Ng of Singapore, 214-186. Ng was looking to win the first two titles of the 2018 season. In the opening match, O’Keefe downed Sweden’s Ida Andersson, 226-160. Andersson was looking for her first PWBA title. O’Keefe made a late charge to the stepladder finals during Saturday’s Round of 12, where she jumped from 10th to fourth in the standings on the strength of a 276 effort in Game 5 of the six-game block. Competition this week at the PWBA Sonoma County Open at Double Decker Lanes included two eight-game qualifying blocks on Friday to determine the 32 players for Saturday’s Round of 32. An additional eight-game block Saturday morning narrowed the field to 12 players, who bowled six additional games to determine the stepladder finalists. The 2018 PWBA Tour season continues next week with the PWBA Fountain Valley Open at Fountain Bowl in Fountain Valley, California. Qualifying and match-play rounds of PWBA Tour events are broadcast on Xtra Frame, which also will be the livestream home for the stepladder finals of seven standard events. 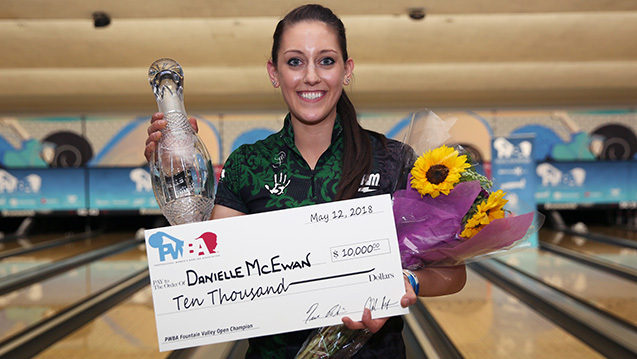 FOUNTAIN VALLEY, Calif. – Mother’s Day is a day each year where children honor their mothers for being great, and Danielle McEwan of Stony Point, New York, gave her mother an early present Saturday by winning the Professional Women’s Bowling Association Fountain Valley Open. McEwan, the No. 3 seed, ran the stepladder and defeated Bryanna Coté of Red Rock, Arizona, in the title match, 215-182, to win her fourth career PWBA Tour title. In the process, she joined last week’s PWBA Sonoma County Open champion Shannon O’Keefe of O’Fallon, Illinois, as the only players to win a title in each season since the relaunch of the PWBA Tour in 2015. The stepladder finals were streamed live on Xtra Frame, the Professional Bowlers Association’s online bowling channel. In the championship match, McEwan began with three consecutive strikes, which echoed a tone she’d set in her previous matches by getting off to strong starts. Coté struggled to find a look early in the match, but she still managed to give herself a chance to win with strikes in the eighth and ninth frames. McEwan countered with a strike in the ninth, and she sealed the victory with a spare to start the 10th frame to collect the $10,000 top prize. McEwan didn’t record an open frame during her three wins. It’s a fact she didn’t even notice because she was intently focused on keeping her process the same throughout the stepladder finals. Her mental game has played an important role in her continued development as a player, and it’s something she’s focused on improving since last season. In McEwan’s three previous wins, her mother, Susan Varano, had been present for each victory. With the stepladder finals being held in the host center during the 2018 season, Varano was not in attendance for this championship-round appearance. This presented a different feeling and vibe for McEwan, who was used to looking up and seeing her mother watching on as a spectator. But, perhaps more than anything, it provided McEwan a different perspective and understanding of just how important her mother is and has been. McEwan advanced to the title match after defeating No. 2 seed Rocio Restrepo of Louisville, Ohio, 247-209. 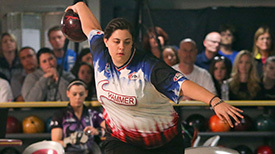 Restrepo was looking for her fourth career PWBA Tour title. In the opening match, McEwan defeated local favorite Missy Parkin of Laguna Hills, California, 220-202. Competition this week at the PWBA Fountain Valley Open at Fountain Bowl included two eight-game qualifying blocks on Friday to determine the 32 players for Saturday’s Round of 32. An additional eight-game block Saturday morning narrowed the field to 12 players, who bowled six additional games to determine the stepladder finalists. The 2018 PWBA Tour season continues next week with the first major of the season at the United States Bowling Congress Queens at the National Bowling Stadium in Reno, Nevada. RENO, Nev. – Shannon O’Keefe now has claimed the last two majors on the Professional Women’s Bowling Association Tour after winning the 2018 United States Bowling Congress Queens on Tuesday. 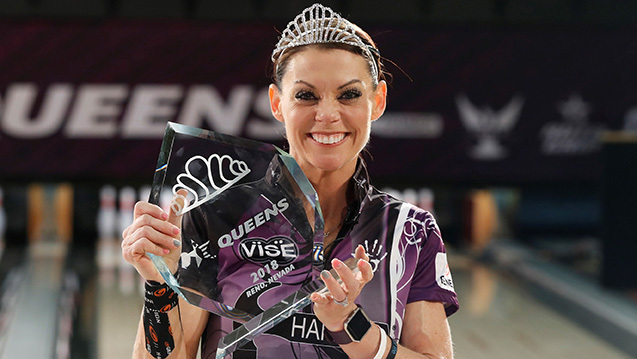 The 39-year-old right-hander from O’Fallon, Illinois, put the finishing touches on a dominating week at the National Bowling Stadium as she defeated Bryanna Coté of Red Rock, Arizona, in the title match, 221-189, to capture the coveted tiara awarded to the winner and $20,000 top prize. Coté, the top seed for Tuesday’s stepladder finals, earned $11,000 for the runner-up finish. O’Keefe grabbed the early advantage in the title tilt after Coté started with back-to-back splits. She opened the door for a brief moment after leaving the 4-6-7-10 split in the fifth frame. Coté, a 32-year-old right-hander, went 6-0 in match play to earn the top seed for the second consecutive week on the PWBA Tour. She led the way at last week’s PWBA Fountain Valley Open but lost in the title match to Danielle McEwan of Stony Point, New York, 215-182. O’Keefe advanced to the title match by delivering eight strikes against USBC Hall of Famer and two-time Queens champion Liz Johnson of Palatine, Illinois, 247-224. Johnson was looking to join fellow hall of famers Mildred Ignizio (1967, 1970, 1971) and Wendy Macpherson (1988, 2000, 2003) as the event’s only three-time champions. Liz Johnson bested Stefanie Johnson of McKinney, Texas, to advance to the semifinals, 232-212. Liz Johnson bounced back from an open in the third frame to roll strikes on six of her next seven shots, while Stefanie Johnson left four consecutive nine counts starting in the sixth frame. In the opening round of the stepladder, Stefanie Johnson put together a late run of strikes to hold off Amanda Fry of Antelope, California, 200-172. Fry had the chance to win the match with a double in the 10th frame but left a 4-6-10 split on her first delivery. A total of 191 bowlers from 14 countries competed in three five-game qualifying blocks over three days to determine the 63 players joining defending champion Diana Zavjalova of Latvia in the double-elimination match-play bracket. Zavjalova, a two-time Queens champion, finished this year’s event tied for 17th place. All rounds of competition leading up to the stepladder finals were broadcast on Xtra Frame, the exclusive online bowling channel for the Professional Bowlers Association. To subscribe, visit XtraFrame.TV. Champion: Josie Barnes of Nashville, Tenn.
EAST HARTFORD, Conn. – For a little more than a week, Josie Barnes of Nashville, Tennessee, reflected on a missed opportunity she let slip away during the first major championship of the Professional Women’s Bowling Association Tour season. 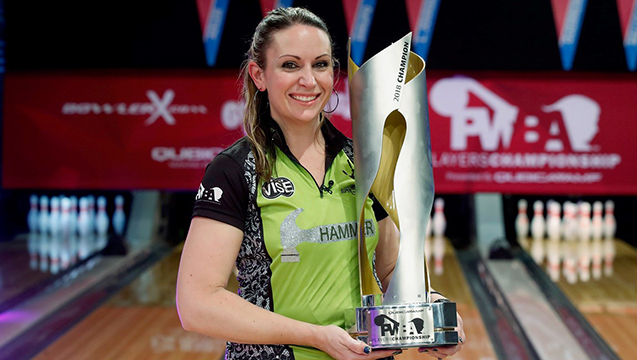 Now, at least for the next couple of days, Barnes will be thinking about how sweet it is to be a two-time PWBA Tour champion. Barnes, the No. 4 seed, defeated top seed Danielle McEwan of Stony Point, New York, 224-216, on Saturday to claim the 2018 PWBA East Hartford Open title at Silver Lanes. In all, she won three matches during the stepladder finals to capture her first win since the 2016 season. The championship match was exciting from the start, but it was McEwan who took the early lead after tossing strikes in four of her first six frames. Barnes, who opened the match with a double, ran into trouble in the sixth frame after leaving a 4-7-10 split, which left her trailing McEwan by 24 pins. The resilient Barnes fired strikes in frames seven, eight and nine, while McEwan traded strikes and spares and had zero open frames. Barnes stepped up in the 10th frame needing to double for the chance to shutout McEwan but was unable to get the second strike, giving McEwan an opportunity of her own to fill 26 pins and capture her second title of the season. McEwan, who won the 2018 PWBA Fountain Valley Open, left a 2-7-8 combination on her first delivery to allow Barnes to emerge victorious. While her first title was one she’ll never forget, Saturday’s win confirmed all her hard work, struggles and close calls were worth every ounce of energy. At the 2018 United States Bowling Congress Queens, the first major of the 2018 season, Barnes missed a 10 pin in the final frame of her three-game match against three-time reigning PWBA Player of the Year Liz Johnson of Palatine, Illinois, which would have helped her advance to the next round. Johnson went on to throw three strikes in her 10th frame to defeat Barnes, 632-630, and it served as the ultimate learning experience in helping Barnes prepare for her next event. Barnes now has earned an invitation to the PWBA Tour Championship at Richmond Raceway in September with her victory. She last appeared at the event in 2016 and looks forward to returning to the pinnacle event of the season. Barnes advanced to the title match by defeating Lindsay Boomershine of Perry, Utah, 238-190. Boomershine was looking for her first career PWBA title. In the opening match, Barnes defeated the early front-runner for PWBA Player of the Year, Shannon O’Keefe of O’Fallon, Illinois, 233-217. O’Keefe already has two titles in 2018, winning the PWBA Sonoma County Open and USBC Queens. Competition this week at Silver Lanes included two eight-game qualifying blocks on Friday to determine the 32 players for Saturday’s Round of 32. An additional eight-game block Saturday morning narrowed the field to 12 players, who bowled six additional games to determine the stepladder finalists. The 2018 PWBA Tour season continues next week with the sixth stop of the season at the PWBA Louisville Open at Fern Valley Strike and Spare in Louisville, Kentucky. Champion: Erin McCarthy of Omaha, Neb. 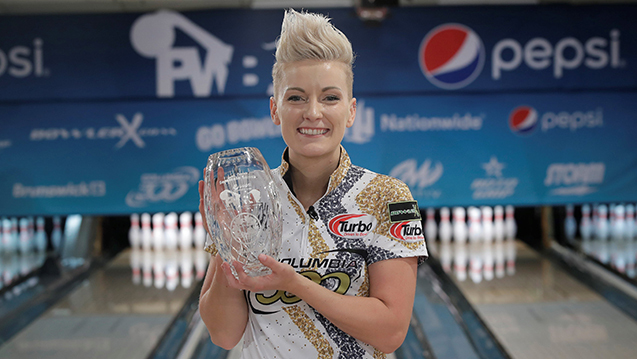 LOUISVILLE, Ky. – Since the relaunch of the Professional Women’s Bowling Association Tour in 2015, Erin McCarthy of Omaha, Nebraska, has been knocking on the door of becoming a champion, and she walked through Saturday after winning the 2018 PWBA Louisville Open. McCarthy, the top qualifier, defeated No. 3 seed Maria Jose Rodriguez of Colombia, 259-210, to capture the win at Fern Valley Strike and Spare for her first career PWBA title. McCarthy came out on fire in the championship match, tossing seven consecutive strikes before a 10 pin ended her run at perfection in the eighth frame. Rodriguez also started strong with three consecutive strikes, but she quickly found herself down after an 8-10 split in the fifth frame. Rodriguez wouldn’t go away as she countered with strikes in frames six, seven and eight to keep it close, but an open frame in the ninth sealed the victory for McCarthy. McCarthy is no stranger to stepladder finals, with three top-five finishes since 2015, including two of those finishes coming at major events (2015 United States Bowling Congress Queens and 2017 U.S. Women’s Open). But, this week felt slightly different for McCarthy because she’s been busier with life off the lanes and has only competed in three events. The 27-year-old right-hander has been busy working two jobs as a registered nurse and enhancing the new home she’s recently purchased. 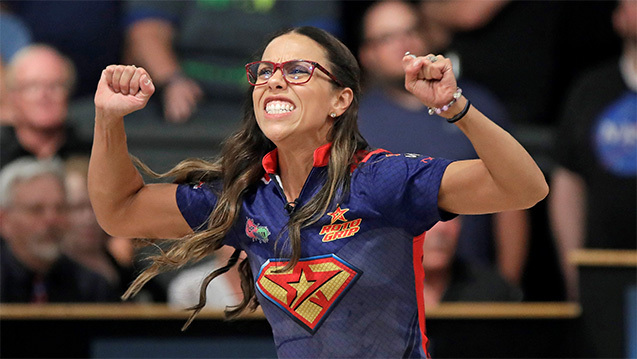 In an odd way, the time away from the PWBA Tour has helped her feel more relaxed, which is different in comparison to previous attempts at winning. The busy schedule means McCarthy spends many days at one of the two hospitals she’s employed at, which also means she spends many days with her inquisitive co-workers. Those individuals have helped McCarthy by being supportive of her goals and dreams on the lanes. Rodriguez advanced to the title match by defeating Danielle McEwan of Stony Point, New York, 228-149. McEwan was looking for her second title of the season. In the opening match, Rodriguez defeated Esther Cheah of Malaysia, 265-168. Cheah was looking for her first career PWBA Tour title. Competition this week at the PWBA Louisville Open at Fern Valley Strike and Spare included two eight-game qualifying blocks on Friday to determine the 32 players for Saturday’s Round of 32. An additional eight-game block Saturday morning narrowed the field to 12 players, who bowled six additional games to determine the stepladder finalists. The 2018 PWBA Tour season continues next week with the seventh stop of the season at the PWBA Greater Harrisburg Open at ABC West Lanes in Mechanicsburg, Pennsylvania. Champion: Jordan Richard of Tipton, Mich.
MECHANICSBURG, Pa. – In just her fourth career Professional Women’s Bowling Association Tour event, Jordan Richard of Tipton, Michigan, rolled to a dominating win Saturday at the PWBA Greater Harrisburg Open. Richard earned the top seed through qualifying and defeated eight-time PWBA Tour champion Shannon O’Keefe of O’Fallon, Illinois, in the title match at ABC West Lanes, 222-194. The 22-year-old right-hander looked at home in the early stages of the title tilt, delivering strikes on three of her first four shots. Although she opened in the fifth frame after leaving the 4-6-7 split, Richard showed the poise of a veteran as she bounced back with strikes in the eighth and ninth frames. O’Keefe, a 39-year-old right-hander in search of her third title of the season, stayed clean to force Richard to mark in the 10th frame. Richard rolled a strike to seal the victory and earn her spot in the season-ending PWBA Tour Championship. Richard’s trek from a collegiate standout at Arkansas State to becoming a PWBA Tour champion happened with the support of her family members, who were on-site at ABC West Lanes for her victory. In addition to her parents, she was joined in the celebration by her sisters and nephew, including fellow PWBA Tour rookie Haley Richard. Richard joined the PWBA Tour just before the United States Bowling Congress Queens in May, and now finds herself as one of the front-runners for PWBA Rookie of the Year. O’Keefe, who made her fourth championship-round appearance of the season, benefitted from a pair of 10th-frame miscues from her opponents on the way to the title match. In the semifinal, O’Keefe finished with 170, forcing Lindsay Boomershine of Perry, Utah, to roll nine on the first shot of the 10th frame to advance. Boomershine left the 1-2-10 combination and was unable to convert, finishing with 167. In the opening game of the stepladder, O’Keefe finished with 157, giving Bryanna Coté of Red Rock, Arizona, the chance to move on with a mark in her final frame. Coté left a 7 pin and missed the spare to finish with 150. Competition this week at the PWBA Greater Harrisburg Open included two eight-game qualifying blocks on Friday to determine the 32 players for Saturday’s Round of 32. An additional eight-game block Saturday morning narrowed the field to 12 players, who bowled six additional games to determine the stepladder finalists. The 2018 PWBA Tour season will continue June 23 with the second major of the year, the U.S. Women’s Open. The event will be held at Boardwalk Bowl in Orlando , Florida, with the stepladder finals airing live on CBS Sports Network on June 30 at 5 p.m. Eastern. ORLANDO, Fla. – The road to the U.S. Women’s Open finals is long and tedious, especially if you start back in the pack. Liz Kuhlkin of Schenectady, New York, in 64th place after the opening round of the U.S. Women’s Open, completed an epic climb Saturday with a 218-196 victory over top-seed Stefanie Johnson of McKinney, Texas, to capture her first major title. Kuhlkin used two big games in the final round of qualifying to make the first cut, and a 299 game in the final round of match play to make the finals, televised live on CBS Sports Network. As the fifth seed, Kuhlkin had to win three matches for the chance to bowl Johnson for the title. She then would enter the final frame with the chance to close out Johnson, and finished the climb with a strike and a 9-count. The emotion of knowing what she had accomplished was evident. Johnson, who bowled and worked at Boardwalk Bowl while attending the University of Central Florida, was seeking her first major title. She led after qualifying and, despite a brief hiccup in match play, grabbed the top seed. Johnson said it’s one game where anything can happen, on either side of the equation. Kuhlkin said that’s why she actually likes being a lower seed. In the semifinal match, Kuhlkin and Erin McCarthy of Omaha, Nebraska, each had open frames in two of their first three frames. Kuhlkin, however, strung together strikes in frames 4-8 to take a 213-186 victory. Kuhlkin produced her biggest game of the day against No. 3 seed Danielle McEwan of Stony Point, New York. Kuhlkin struck on her first five shots and nine times overall in a 246-172 victory. In the opening match, Kuhlkin faced Shannon O’Keefe of O’Fallon, Illinois, who was seeking her third consecutive major title. O’Keefe opened with a trio of spares while Kuhlkin struck on five of her first six shots. A missed 10-pin in the seventh frame by O’Keefe allowed Kuhlkin to take a 21-pin lead, and she went on to a 235-214 victory. Competition at the 2018 U.S. Women’s Open consisted of three days of eight-game qualifying rounds before the field was cut to the top 36 players for an eight-game cashers’ round. The 32-game pinfall totals determined the 24 bowlers for round-robin match play. The 56-game totals, including 30 bonus pins for each win in match play, will decided the five players for the stepladder finals. Champion: EJ Tackett of Huntington, Ind. and Liz Johnson. 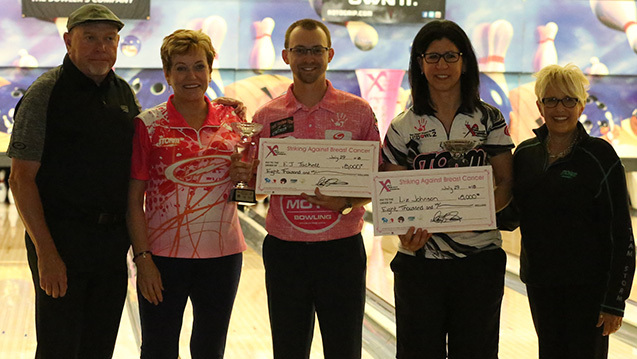 HOUSTON – EJ Tackett of Huntington, Ind., and Liz Johnson of Palatine, Ill., survived a dramatic final game to win the 19th PBA/PWBA Storm Striking Against Breast Cancer Mixed Doubles title at Copperfield Bowl Sunday, sending Australia’s Jason Belmonte and Chicago’s Diandra Asbaty to their third consecutive runner-up finish. Tackett, PBA’s 2016 Player of the Year, and Johnson, one of two women ever to win a PBA Tour title, led the tournament through 17 games before being overtaken by Belmonte and Asbaty. Trailing Belmonte and Asbaty by 10 pins going into the final match, victory in the tournament was going to be decided by whichever team won the game. Thanks in great part to a bold move by Johnson to an extreme outside angle on the left lane while continuing to play an inside angle along with the rest of the field on the right lane, she gave her team the edge with a 212-192 margin over Asbaty. Tackett was unable to strike in his 10th frame, but Belmonte, needing a double for the win, left a 10 pin on his first shot in his 10th frame. While Belmonte out-scored Tackett, 214-208, but it wasn’t quite enough. Tackett and Johnson, bowling as partners for the first time in the event, won the final match, 420-406, and earned 30 match play bonus pins to post a composite 20-game total of 8,797 pins to win by a 34-pin margin. “I’m ecstatic,” said Tackett, who earned his 11th PBA Tour title and second of the 2018 Go Bowling! PBA Tour season. “I’m so happy for Liz. I’m so proud to be part of this win. There was not a single person in this building who could have done what she did in that last game. It was absolutely amazing watching her play outside on one lane, inside on the other. “I’m pretty numb,” Johnson said of her 20th PWBA title. “It’s taken me 17 years to win here. People say ‘You’ve won everything,’ but this is a major title to me. I’m so proud. This is my favorite tournament of the year. PBA Tour players will return to competition in a pair of PBA Xtra Frame on FloBowling events in August – the PBA Xtra Frame Gene Carter’s Pro Shop Classic at Mid-County Lanes in Middletown, Del., Aug. 17-19, followed by the PBA Xtra Frame Kenn-Feld Group Classic at Pla-Mor Lanes in Coldwater, Ohio, Aug. 24-26. Both events will be live stream exclusively on PBA’s online channel, PBA Xtra Frame on FloBowling. For subscription information, visit FloBowling.com. The Professional Women’s Bowling Association continues its 2018 schedule in the Pepsi PWBA St. Petersburg-Clearwater Open at Seminole Lanes in Seminole, Fla., Aug. 2-4. 1, Liz Johnson, Palatine, Ill./EJ Tackett, Huntington, Ind., 8,797, $16,000. 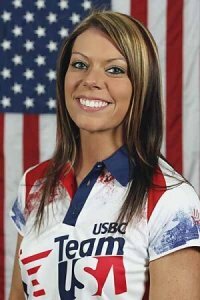 2, Diandra Asbaty, Chicago/Jason Belmonte, Australia, 8,763, $8,000. 3, Danielle McEwan, Stony Point, N.Y./Chris Via, Springfield, Ohio, 8,694, $5,000. 4, Shannon O’Keefe, O’Fallon, Ill./Bill O’Neill, Langhorne, Pa., 8,621, $4,000. 5, Shannon Pluhowsky, Dayton, Ohio/Tommy Jones, Simpsonville, S.C., 8,585, $3,000. 6, Erin McCarthy, Omaha, Neb./AJ Johnson, Oswego, Ill., 8,570, $2,650. 7, Missy Parkin, Laguna Hills, Calif./Sean Rash, Montgomery, Ill., 8,560, $2,450. 8, Leanne Hulsenberg, Pleasant View, Utah/Darren Tang, San Jose, Calif., 8,500, $2,350. 9, Natalie Cortese, Hoffman Estates, Ill./Brad Miller, Raytown, Mo., 5,141, $2,200. 10, Liz Kuhlkin, Schenectady, N.Y./Richard Teece, England, 5,138, $2,150. 11, Tannya Roumimper, Indonesia/Francois Lavoie, Canada, 5,109, $2,100. 12, Angela Chirpich, Urbandale, Iowa/Tom Hess, Urbandale, Iowa, 5,100, $2,050. 13, Katie Garcia, Wichita, Kan./Geoffrey Young, Keller, Texas, 5,089, $2,000. 14, Kayla Pashina, Minnetonka, Minn./Rhino Page, Dade City, Fla., 5,087, $1,950. 15, Tina Williams, Phoenix/Anthony Simonsen, Austin, Texas, 5,031, $1,900. 16, Taylor Bulthuis, Coral Springs, Fla./Jakob Butturff, Tempe, Ariz., 5,039, $1,850. 17, Giselle Poss, Montgomery, Ill./Matt Gasn, Clarksville, Tenn., 5,005, $1,800. 18, Verity Crawley, England/Wes Malott, Pflugerville, Texas, 5,004, $1,750. 19, Misaki Mukotani, China/Nobuhito Fujii, Japan, 5,001, $1,700. 20, Bryanna Cote, Red Rock, Ariz./Stuart Williams, England, 4,998, $1,650. 21, Kerry Smith, Lititz, Pa./John Furey, East Windsor, N.J., 4,976, $1,600. 22, Sydney Brummett, Fort Wayne, Ind./Kris Prather, Plainfield, Ill., 4,961, $1,550. 23, Daria Kovalova, Ukraine/Joshua Roca, Wichita, Kan., 4,954, $1,500. 24, Christina Kinney, Las Vegas/Robert Lawrence, Del Valle, Texas, 4,950, $1,450. 25, Lindsay Boomershine, Perry, Utah/Kyle Troup, Taylorsville, N.C., 4,949, $1,400. 26, Josie Barnes, Hermitage, Tenn./Chris Barnes, Double Oak, Texas, 4,942, $1,350. 27, Sierra Kanemoto, Dayton, Ohio/Andrew Anderson, Holly, Mich., 4,940, $1,300. 28, Birgit Poppler, Germany/Jason Sterner, Cocoa, Fla., 4,939, $1,250. 29, Kayla Bandy, Salisbury, Md./Nathan Bohr, Wichita, Kan., 4,912, $1,190. 30, DeeDee Jeffery, Little Rock, Ark./Mykel Holliman, Memphis, Tenn., 4,903, $1,140. 31 (tie), Holly Harris, Wichita, Kan./Devin Bidwell, Wichita, Kan., and Haley Richard, Tipton, Mich./Nick Pate, Inver Grove Heights, Minn., 4,899, $1,065. 33, Carol Norman, Houston/Pete McCordic, Katy, Texas, 4,863, $990. 34, Cassandra Shivers-Williams, Adelphi, Md./Fero Williams, Adelphi, Md., 4,833, $940. 35, Diana Zavjalova, Latvia/Adam Pogge, Austin, Texas, 4,800, $880. 36, Jeanne Naccarato, Tacoma, Wash./Chris Warren, Grants Pass, Ore., 4,798, $840. 37, Jackie Carbonetto, Clarksville, Tenn./Tom Daugherty, Riverview, Fla., 4,782, $780. 38, Shannon Sellens, Copiague, N.Y./Anthony Pepe, East Elmhurst, N.Y., 4,769, $740. 39, Stephanie Schwartz, Racine, Wis./Steve Lemke, Nacogdoches, Texas, 4,764, $720. 40, Kiyoko McDonald, Allen, Texas/Clint Johnson, Fort Worth, Texas, 4,758, $700. SEMINOLE, Fla. – A high-scoring week at Seminole Lanes became a much more difficult test in the stepladder finals of the Pepsi PWBA St. Petersburg-Clearwater Open on Saturday. But No. 5 seed Diana Zavjalova of Latvia was able to fight through to win her opening match, then climbed the stepladder to capture her third PWBA title with a 201-158 victory over top-seed Daria Pajak of Poland. The finals of the Pepsi PWBA St. Petersburg-Clearwater Open, which had five bowlers who are all in their 20s, were televised live on CBS Sports Network. Zavjalova, who celebrated her 27th birthday on Wednesday, admitted that after a high-scoring week, she didn’t know what to expect with the finals on a pair of lanes not used during the week. An early double in the title match helped Zavjalova to an 18-pin lead after six frames, and when Pajak, 25, missed a 10-pin spare attempt for the second time in the match, Zavjalova simply continued to make her spares. In the semifinal match against Liz Kuhlkin, 24, of Schenectady, New York, Zavjalova was in a groove, striking on six of her first seven shots. Kuhlkin, who ran the stepladder to win the U.S. Women’s Open in June, managed only two strikes and suffered her first loss in a stepladder finals, 225-157. Zavjalova had missed two spare attempts in the opening five frames of her second match against Jordan Richard, 22, of Tipton, Michigan. After a missed 10-pin spare attempt in the fifth frame, Zavjalova did not miss anything the rest of the match, finishing with seven consecutive strikes in a 226-172 victory. In the opening match, Zavjalova slipped past Verity Crawley, 24, of England, 185-168, in a match that took some big momentum swings in the final frames. Zavjalova had a 10-pin lead entering the ninth frame, but left the 2-4-10 on her first shot and could not convert. Crawley, with a chance to clear the deficit, hit the pocket only to leave the 7-10 split. Zavjalova struck on her first shot in the final frame to clinch. For Zavjalova, winning the title meant going through Crawley in the opening match and Pajak in the title match. The three were teammates at Webber International and travel together on the PWBA Tour. The Pepsi PWBA St. Petersburg-Clearwater Open is the first of three elite-field events that will take place in August. Following the U.S. Women’s Open, the top 24 players on the PWBA points list earned their way into the elite-field events with the remainder of the 32-player field determined through a pre-tournament qualifier (PTQ). Players had 16 games of qualifying on Friday before the field was cut to the top 12. Six additional games on Saturday morning determined the five players for the stepladder finals. Champion: Rocio Restrepo of Louisville, Ohio. 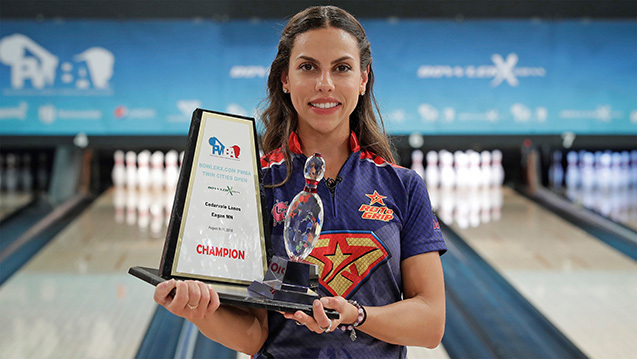 EAGAN, Minn. – Although the road to the season-ending Professional Women’s Bowling Association Tour Championship may have had more bumps than planned in 2018 for Colombia’s Rocio Restrepo, she returned to form Saturday on the way to winning the BowlerX.com PWBA Twin Cities Open. Restrepo defeated top seed Liz Kuhlkin of Schenectady, New York, in the championship match at Cedarvale Lanes, 224-193, to claim her fourth career PWBA Tour title and $10,000 top prize. The finals of the BowlerX.com PWBA Twin Cities Open were televised live Saturday on CBS Sports Network. The tightly contested title match saw Restrepo gain the early lead after Kuhlkin was unable to strike in her first four frames, which included a missed 4 pin in the first frame. After a ball change to start the fifth frame, Kuhlkin found the right line and rolled four consecutive strikes to make up the difference and take the lead. Kuhlkin delivered another pocket shot in the ninth frame but left the 7 pin standing, which she was unable to convert. 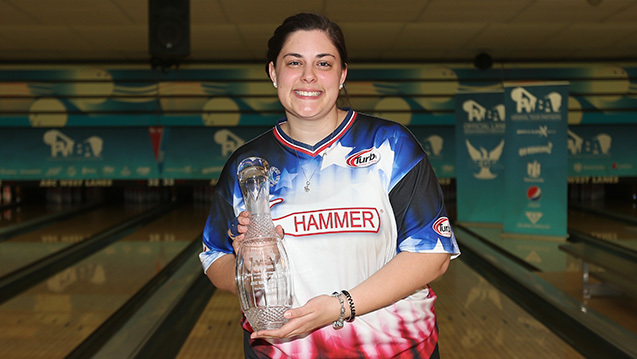 Given the chance to seize the victory, Restrepo delivered a pair of strikes in the ninth and 10th frames to win her first title of the 2018 season. Although the win came down to executing in her final frame, the decision at the beginning of her semifinal match to use a different bowling ball on each lane helped to put her in that position. Restrepo, a 30-year-old right-hander, saw the trend earlier on Saturday as she earned the No. 2 seed for the stepladder finals. Restrepo, the runner-up for PWBA Player of the Year in 2016, has battled injuries and even some bad luck over the course of the 2018 season. After recording a third-place finish at the PWBA Fountain Valley Open in May, she had not approached another championship-round appearance, with a best finish of 13th at the PWBA Greater Harrisburg Open. At last week’s Pepsi PWBA St. Petersburg-Clearwater Open, travel issues caused her to miss the first round of qualifying after competing for Colombia at the Central American and Caribbean Sports Games in Barranquilla, Colombia. Although she’s still working to get back to where she’d like to be on the lanes, Restrepo now is ready to take advantage of the rest of the season. 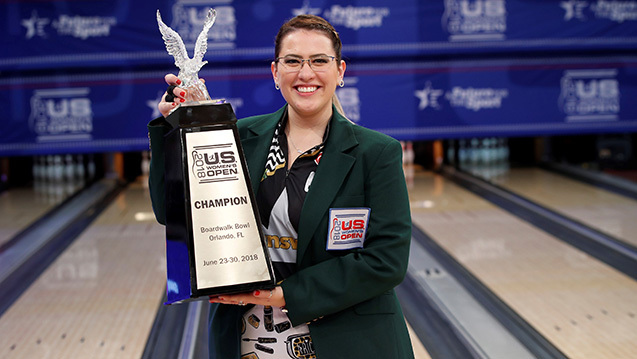 Kuhlkin had led every round leading up to the stepladder finals and made her third consecutive appearance on CBS Sports Network after winning the U.S. Women’s Open and placing third last week at Seminole Lanes in Seminole, Florida. The 24-year-old right-hander trusted her next move after making the ball change in the fifth frame and hopes to continue the momentum she’s found in the second half of the season. Restrepo earned her spot in the title match by defeating Jordan Richard of Tecumseh, Michigan, 201-170. Restrepo was able to stay clean after an early open frame, while Richard, who’s the leading candidate to claim PWBA Rookie of the Year after capturing the win at the PWBA Greater Harrisburg Open, had back-to-back open frames on the left lane to end the match. Richard bested the front runner for PWBA Player of the Year, Shannon O’Keefe of Shiloh, Illinois, to advance to the semifinals, 197-192. Richard bounced back from a missed 4 pin in the fourth frame to put the pressure on O’Keefe in the 10th. O’Keefe, a two-time winner this season, needed a double in the final frame to move on, but she left her third consecutive 10 pin to finish in fourth place. In the opening match of the stepladder finals, Richard posted an early run of five consecutive strikes against Josie Barnes of Nashville, Tennessee, to collect the win, 236-203. Barnes, the only player to roll a 300 during the week at Cedarvale Lanes, was unable to make up any ground after a pair of 7-10 splits in the first five frames. The BowlerX.com PWBA Twin Cities Open is the second of three elite-field events taking place in August. Following the U.S. Women’s Open, the top 24 players on the PWBA points list earned their way into the elite-field events with the remainder of the 32-player field determined through a pre-tournament qualifier (PTQ). Champion: Liz Johnson of Palatine, IL. COLUMBUS, Ohio – Reigning three-time Professional Women’s Bowling Association Player of the Year Liz Johnson showed she’s ready for the final events of the PWBA Tour season by making a title-winning run at the Nationwide PWBA Columbus Open on Saturday. 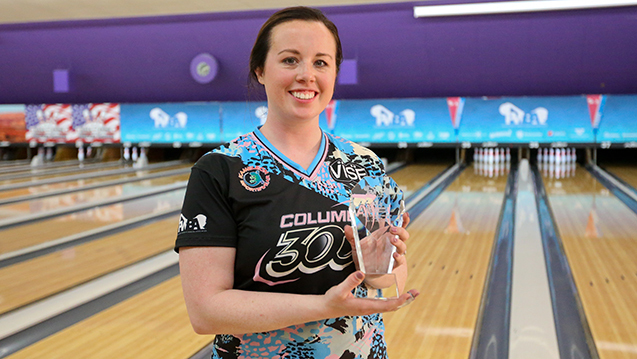 Johnson rolled 23 strikes over three matches at Wayne Webb’s Columbus Bowl to snag her 24th professional title. In the title match against top seed Shannon Pluhowsky of Dayton, Ohio, Johnson flirted with a perfect game, connecting on her first nine shots before a 10 pin ended the run in a 278-202 victory. Johnson started Saturday’s final round of qualifying with a 289 game, leaving a 10 pin on her second shot in the final frame. Pluhowsky remains without a PWBA title, having lost as the No. 1 seed for the third time. Her other two losses as the top seed came in 2016. Early in Saturday’s match, she left a 9 pin on a solid shot followed by an open frame despite a good shot on the spare attempt. Colombia’s Rocio Restrepo provided a tough test for Johnson in the semifinal. In a tight match throughout, Restrepo struck twice in the final frame to force Johnson to have to match her. Johnson started her run against Colombian native Clara Guerrero, striking on seven of her first eight shots. Guerrero, meanwhile, could not put together consecutive strikes as Johnson won, 234-205. Guerrero did string together strikes in the opening match. She struck on four of her first five shots to build a 19-pin lead against rookie Jordan Richard of Tecumseh, Michigan, who was making her third consecutive television show. 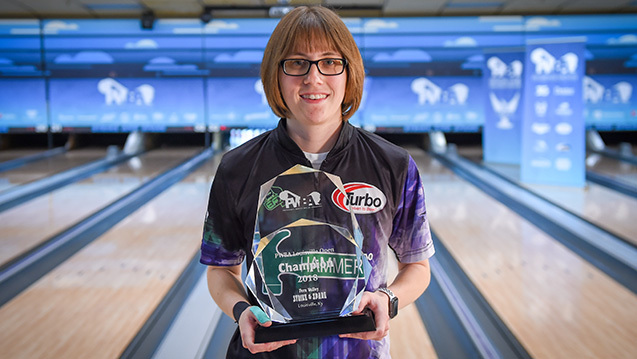 PLANO, Texas – Stefanie Johnson captured her first career major championship Saturday by winning the 2018 QubicaAMF Professional Women’s Bowling Association Players Championship. Johnson defeated Kelly Kulick of Union, New Jersey, in a tightly contested title match at Plano Super Bowl, 230-200, to claim the $20,000 top prize. The finals of the PWBA Players Championship, the third major of the 2018 season, was broadcast live on CBS Sports Network. Johnson, a 34-year-old right-hander, took advantage of two fortunate strikes in the early going to start with four consecutive strikes but was unable to mark on the left lane in the fifth and seventh frames, letting Kulick even the match. A strike in the eighth frame led Johnson back to her troublesome lane in the ninth, but she executed one of the biggest shots of her career to reclaim the advantage with a double. Kulick, who was the runner-up at the PWBA Players Championship last year in Green Bay, Wisconsin, ran into trouble in the ninth frame after making a jump to the left, leaving a 7-10 split. She was able to double in the 10th frame to force Johnson to mark to win her third PWBA Tour title, and Johnson delivered her third consecutive strike to win. Johnson struck on six of seven shots on the right lane and relied on trusting her judgment in using a new bowling ball in the title match. Johnson’s win came in her third championship-round appearance this season. She has advanced to the finals in each of the three majors in 2018, including a runner-up finish at the U.S. Women’s Open in June. The win not only was special for breaking through for her first major, but also for being able to collect the victory in front of a hometown crowd, including family and friends. Johnson lives in nearby McKinney, Texas, and works at Plano Super Bowl. Kulick made her first championship-round appearance of the 2018 season this week, and the effort helped her solidify her spot in the season-ending PWBA Tour Championship next month. She was able to make her run at Plano Super Bowl after sharpening her physical game last month during Team USA camp at the International Training and Research Center in nearby Arlington, Texas. Kulick defeated Danielle McEwan of Stony Point, New York, in the semifinal, 224-206. Kulick took the early advantage after starting with five consecutive strikes but let McEwan back in the match after a 3-6-7-10 split in the eighth frame. McEwan, a four-time PWBA Tour champion, rolled four consecutive strikes starting in the sixth frame but left a 10 pin to start the 10th frame to end her comeback. The semifinal match also had implications in the race for PWBA Player of the Year. McEwan needed to advance to the title match for the opportunity to challenge Shannon O’Keefe of Shiloh, Illinois, for the coveted award at the Tour Championship, but her third-place finish mathematically gave O’Keefe the distinction for the first time in her career. O’Keefe, a 39-year-old right-hander, won two titles this season, including the United States Bowling Congress Queens in May. Kulick advanced to the semifinal after starting her match against 2018 PWBA Rookie of the Year Jordan Richard of Tecumseh, Michigan, with seven consecutive strikes, finishing with a 244-171 win. Richard, a 22-year-old right-hander making her fourth consecutive television appearance, locked up Rookie of the Year this week. In Saturday’s opening match, Richard delivered 10 strikes on her way to a 244-156 victory over Lindsay Boomershine of Perry, Utah. Boomershine, who was making her second consecutive championship-round appearance at the PWBA Players Championship, needed to win her first match in order to earn enough points to advance to the Tour Championship. With Boomershine’s fifth-place finish, Shannon Pluhowsky of Dayton, Ohio, earned the final spot at the Tour Championship from the points list. All competitors at the PWBA Players Championship bowled 18 games of qualifying Thursday to determine the 18 players advancing to round-robin match play. Friday’s match-play rounds featured 18 games, including a position round. Players received 30 bonus pins for each win and 15 bonus pins for a tie. After 36 games, total pinfall, including bonus pins, determined Saturday’s finalists. All rounds leading up to the stepladder finals were broadcast on BowlTV, the official YouTube channel of USBC. The QubicaAMF PWBA Players Championship was the third of four major championships on the 2018 PWBA Tour schedule, and the final event before the season-ending PWBA Tour Championship. The PWBA Tour Championship will take place Sept. 16-19 at Richmond Raceway in Richmond, Virginia. The PWBA Players Championship only was open to PWBA members.